The planters along Steamer Quay were first filled with edible flowers, fruit and vegetables in the summer of 2011, and have continued since then to become more abundant each year. 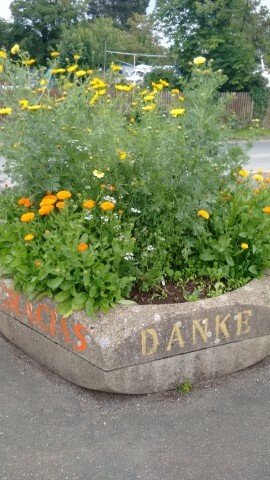 In 2015 we decided to express our gratitude for all this plenty and all the help we'd had from visitors from abroad in six languages around the planters. We have also planted two beds of fruit bushes further along the river bank towards the Rowing club, which give abundant currants, blueberries, honeyberries and raspberries in season, as well as strawberries and rhubarb. Continuing along the riverside to Longmarsh are a small group of nut trees planted away from the river, along a well-trodden path. These are growing slowly but surely since planted in 2007. We meet at the Steamer Quay every Wednesday from 4pm - 6pm to tend the beds, enjoy each others company and share tea together. Everyone is welcome to join in, and all are welcome to share the harvest.